The graphics and illustrations in Dr. Chi’s book are outstanding. Returning to the subject of Dr. Chi’s chapter on back exercises, I was very impressed with Dr. Chi’s emphasis on back extension. The beautiful thing about Dr. Chi’s back exercises is that you do not have to go out and get a back loan for special equipment to do these exercises. Not only does Dr. Chi provide back exercises to maintain healthy flexion and extrension of the spinal column, Dr. Chi also provides exercises to strengthen one’s spine. Again, the directions for these exercises are written very plainly, in cookbook recipe style. As an additional treat, Dr. Chi provides the reader with a scattering of poems, that she has penned, throughout the book. These poems are uplifting and inspiring. They add a touch of class to the book. This book is 343 pages long. So bang for buck, it’s quite a bargain! This is a must read for anyone interested in having a healthy heart! This entry was posted in Accomplishment, Be Strong!, Believe in yourself!, Chiropractic, Creative Writing, Destiny, Determination, Dr. Phoebe Chi, Encouragement, Faith, Giving, Healing, Journey to Truth, Kindness, Spiritual Lesson, Stand Tall, Wisdom. Bookmark the permalink. 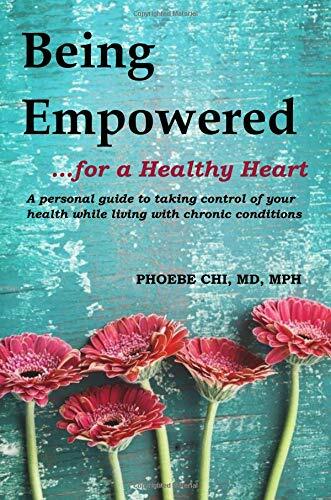 A thoughtful review by Richard Mabey of Being Empowered for a Healthy Heart. Thank you, Richard, for your support!